Brian enjoys working with others out in the community. When his hours stocking and pricing computer games at Best Buy were cut, he wanted to look for more work. Brian's mom helped him get a referral from his adult services agency to an employment program. Brian's parents invited Scott, the job developer from this program, to visit the family at home. They were pleased when Scott quickly discovered Brian's interest in music. Brian's parents told Brian and Scott to let them know how they could help with the job search. Scott researched local businesses related to music. He introduced Brian to Paul, the owner of a store called Recycled Records. Paul agreed to let Brian do a work assessment at the store for a few weeks. During the work assessment, Paul, Brian, and Scott began developing a plan for Brian to run a business converting customers' music collections from CDs and cassettes to digital files. Brian's parents agreed that converting music would be ideal work for him, and they found ways to help Brian start the business. They helped him find a class at Nevada's Small Business Development Center to write a business plan and develop business cards and other marketing materials. Brian's parents also contacted Nevada's Department of Vocational Rehabilitation (VR) to ask about grants for small businesses. They helped Brian apply for an $8,000 grant from VR to pay for a computer, headphones, and other office equipment. Brian's dad got state and city business licenses as well as insurance for the new business. 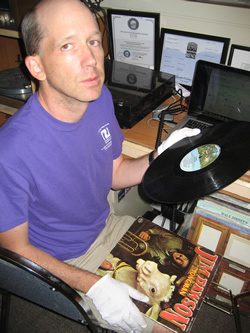 Brian runs his business, Brian's Music Conversion, from the business office at Recycled Records. The business is open two half days a week. Because there isn't enough space in this office for Brian to use all his music conversion equipment, he works an additional four hours a week from home. Brian gives customers their music on a flash drive or CD, and includes the cover artwork from the original album. Brian stores all the music files on his computer in case customers lose their new copy. Brian's business is still in its start-up phase and his earnings vary depending on the amount of work available for him. He enters his earnings for each day into a spreadsheet and his mom helps him keep track of money coming in and out of the business. Brian's parents commented that since Brian has started this business, he has taken a greater interest in learning how to manage money. Brian loves having turned his passion for music into a job. Paul, Brian's boss, is very happy that Recycled Records can offer a quick, high-quality music conversion service to customers. Paul allows Brian to have space in the store's business office rent-free. In return, on days when there isn't much music for Brian to convert, he volunteers at the store with other tasks as needed. Brian's parents found an employment program to help with his job search. Brian's parents told him and Scott, his job developer, that they supported Brian in finding work and wanted to help him succeed. When Brian's job search turned into the start of his own business, his parents found ways to help him get started. Brian's business offers a service that Paul's customers value. This is why Paul agreed to have Brian use the office space rent free. Brian's parents supported him not only to secure the financial resources to develop the business, but to manage earnings as well.